Have you ever read the Bartimaeus Trilogy? If the answer is “yes,” for you this review is practically over. The Ring of Solomon is the same vein of fun, mayhem filled craziness as the trilogy. If you liked the trilogy, what are you waiting for? Get up and obtain a copy to read ASAP. Now if you have read the trilogy, but DIDN’T like it, I have something important for you to do too. Slap yourself across the face once or twice, take a serious look at yourself and see if your sick or something, and take another look at it. And feel ashamed. Shame on you. Ok, we’ve established this book’s cred for those who have read the trilogy before, but what if you’ve never heard of Bartimaeus? Well, The Ring of Solomon is good place to start, since it’s a prequel to the original trilogy, and unlike Star Wars, you don’t get the later books ruined for you by watching them in chronological order. The main character is, of course, Bartimaeus, a type of spirit known as djinni. In the great rankings of spirits and such, he’s pretty much dead center on the power scale. However, his attitude, lack of respect, and ability to deal sarcasm and dry wit is second to none. The series as a whole deals with his misadventures on Earth; mainly using his brains to get him out of the insanely ridiculous messes his mouth gets him into. So the plots intriguing and the characters are interesting. Not enough for you? 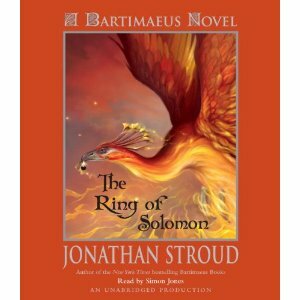 The world of Bartimaeus has a deep, rich mythology that is improved upon with every book, and top of that you get witty comments from Bartimaeus himself in the form of footnotes, which ether explain a scene to you in a more satisfying way than could fit into the plot’s flow, or give you some background info. So, conclusion. The Ring of Solomon is a great book, with great characters, a great plot and (you guessed it) great one-liners you wish you had an excuse to use, but probably never will. Thoroughly entertaining. Might I be so bold to say I liked it better than the original Bartimaeus trilogy?